In Part One, I described the background behind salesforce.com’s embrace of collaboration as a core business strategy. Although social computing and collaboration are critical elements of Marc Benioff’s vision, salesforce.com’s strategy extends more broadly. The company appears to be building a kind of modular, cloud-based enterprise “operating system” comprised of platform, data, and applications. That vision needs an enabling platform, a platform modeled around ecosystems rather than vertically integrated stacks, open rather than proprietary, actively engaging the customer and engaged by the customer. That in turn requires an approach of federation rather than competition, federation with organizations that have similar principles, prepared to be built around the customer at the behest of the customer. Chatter isn’t just social as in people sending status updates to each other. Chatter is software-is-social as in software sending status updates. If all your applications published status updates, with links back to the place in the app where you can get more info or act on the status change, and if all status updates were organized in a taxonomy so you could look at specific topics across apps and people (e.g., a specific customer, or a specific deal, or a specific competitor), that is a potential game changer. Chatter offers a communication transport system, or social “glue,” that binds together the collaboration-related activities of salesforce.com’s social enterprise operating system. Data Layer. As Rangaswami’s quote hints, the social enterprise operating system realizes value by helping organizations assemble modular software components, from multiple vendors, that closely track business needs. The underlying premise assumes flexible and adaptable systems that are more tightly coupled to customer business goals than is possible with monolithic, on-premise enterprise software provided by a single vendor or woven together through elaborate system integration or consulting projects. Force.com, which allows independent software vendors to build applications that seamlessly plug into into the Chatter transport described above. Force.com includes Appforce for rapid development of the CRM system, ISVforce (a series of technologies and processes that enable ISVs to develop on the platform), and Siteforce (a website and content management framework and product). Database.com, which offers developers cloud-based, centralized, database storage for enterprise applications. Database.com is the underlying architecture for all Salesforce technologies. The data layer provides the technical infrastructure needed to enable the “federated” collaboration groups described by J.P. Rangaswami. Skeptics might characterize Rangaswami’s federation as just another way to describe integration between systems, but the Salesforce view assumes greater flexibility, with faster implementations and cheaper integration, than traditional bolt-on product environments. To understand the full significance of collaborative federation among organizations, we must look at the Application Layer. Application Layer. One of the most interesting aspects of Dreamforce was salesforce.com’s announcement of enterprise software partnerships. During the last year, the company focused on investments to encourage attracting a variety of independent software vendors (ISVs) to build products on Force.com. RootStock – Rootstock announced a new version of the product that is integrated with the Force.com PaaS of salesforce.com. This puts RootStock in two of the biggest PaaS platforms for commercial software. In the Force.com ecosystem, RootStock will integrate with other cloud financial software but can directly and tightly integrate with FinancialForce.com and the salesforce.com CRM applications. Rootstock also got investment monies from salesforce.com. The significance of these partnerships lies in their ability to help salesforce.com execute its vision of modular, inherently collaborative, enterprise software. Although Salesforce has long proposed that customers can weave together applications from multiple vendors running on Force.com, the new partnerships bring that vision a step closer to reality. Folks like Workday, Infor, and Kenandy may well possess sufficient enterprise street cred to encourage buyers to take the risk on salesforce.com’s vision. We are seeing a rapid and seemingly unstoppable shift in the way people consume and use all technologies, whether enterprise or consumer. Activity streams, for example, bring elements of discovery and the capture of corporate institutional knowledge into an organization at the corporate and the personal level. Activity streams that are tied into business process enhance and are a necessary part of this discovery – there is an unquestionable advantage to have business data “talk” to you via an activity stream – the alternative is that one has to know what to look for in order to find it. We find that in these days of information overload – real data feeding into your stream provides true value. Meanwhile, we see the platform as a way to develop new applications that take advantage of the technologies that are being built. They don’t necessarily have to be from any one vendor or solution provider – they are being tied together through open APIs, more open business processes, and an innovation cycle that is escalating intensity even if it is still considered nascent technology. Finally, a real catalyst behind all of this is the advent of truly mobile computing platforms, first realized by the iPad and followed by Android and other tablet makers. The concept of booting and loading a desktop computer in a mobile workforce is increasingly becoming anathema to the way people work. These mobile technologies are the catalysts for social growth and when they are tied into the platform and the technology they provide a huge value to any company using it. CIO guidance. 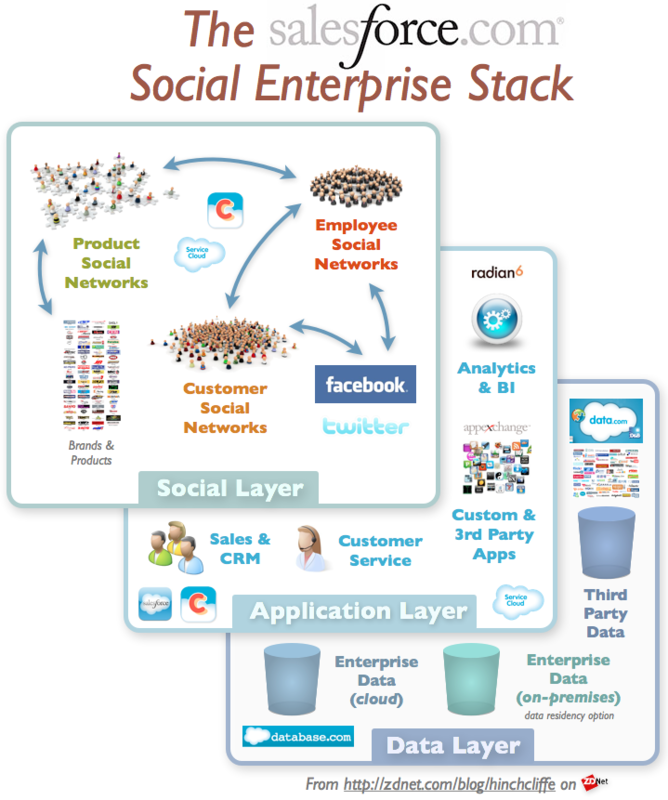 For salesforce.com, the social enterprise describes end-to-end computing services in a strategy that explicitly recognizes the importance of human communication and collaboration. Watch closely to see what happens with the company’s new enterprise partnerships. Although salesforce.com’s day of proof has not yet arrived, we should not dismiss the company’s potential to execute on its vision.